Welcome! 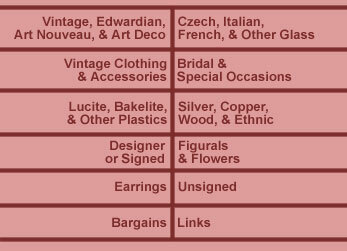 In these webpages you will find antique, vintage and costume jewelry for any occasion, any mood, any pocketbook! We also carry vintage sunglasses, purses and handbags, and other accessories. We are so happy to share our love of these little works of art -- especially vintage glass jewelry which is Jazzle Dazzle's favorite! -- and we hope you will be inspired to try something different and even bookmark our site in your Favorites Folder.